The Aphelion Measurement Tool is a stand-alone application that provides a highly intuitive set of tools for manually measuring objects and regions in an image. Measurements are made through a simple point and click procedure using predefined graphical shapes. This software is fully compatible with Aphelion Developer. 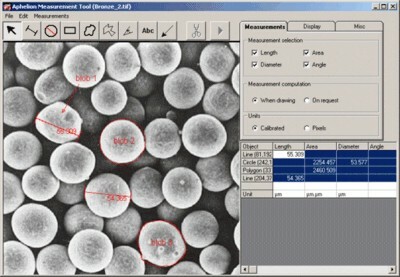 Simple yet powerful tools are provided to compute length measurements (caliper), surface measurements (contouring objects of interest using disks, rectangles, polygons, and free-hand drawing), and angle measurements between three points. The zoom function helps visualization of small details by zooming only the pixels and not the graphics. All computed measurements are output to a grid in the graphical user interface, but may also be exported to Excel, to a text file, or as an Aphelion ObjectSet. Images and associated graphical objects can be placed on the clipboard to be imported into a technical report. Predefined graphical shapes such as disk, rectangles, polygons, etc.